Some Thai workers allegedly were detained at a Maui pineapple farm and told to pay $3,750 to keep their jobs. (CNN) -- Six job recruiters have been indicted in federal court in what the FBI has called the largest human-trafficking operation ever to result in charges in the United States. An indictment unsealed in Hawaii on Thursday accuses employees of a California-based company of luring about 400 people from Thailand with false promises of lucrative jobs. Many of the imported workers wound up laboring on farms under substandard conditions, had their passports confiscated, and were threatened with deportation. 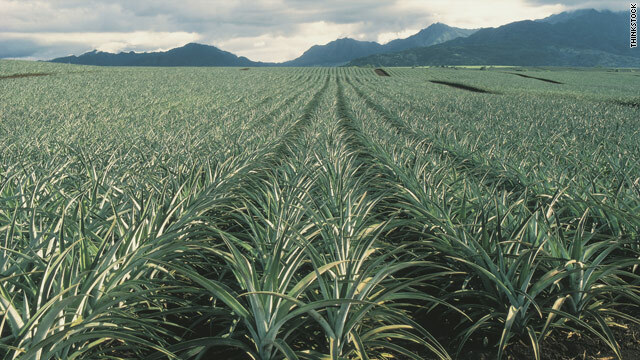 In one instance, several Thai workers allegedly were detained at a pineapple farm on Maui and told to pay an additional fee of $3,750 to keep their jobs. Those who refused were sent back to Thailand with unpaid debts. "The object of the conspiracy was to obtain cheap, compliant labor," said the indictment, "indebted by the defendants' recruitment fees, and to compel the workers' labor and service through threats to have the workers arrested, deported, or sent back to Thailand." The workers were brought to the United States under the federal H2-A visa program, which places foreign workers on U.S. farms. The case was investigated by the Justice Department's Civil Rights Division and the FBI in Honolulu, where many of the guest workers wound up. Four of those charged worked for labor recruiting firm Global Horizons Manpower Inc., based in Beverly Hills, California. Two Thai-based recruiters also were charged. The operation allegedly began in May 2004. Global Horizons President and CEO Mordechai Orian, 45, an Israeli national, was accused of leading the conspiracy. His attorney, Alan Diamante, did not return a message seeking comment. A call to the company was not answered. FBI agents went to Orian's home with an arrest warrant Friday morning, but he was not at home, said Special Agent Tom Simon in Honolulu, Hawaii. He said agents have been in touch with Orian by telephone and are attempting to negotiate his surrender to authorities. There are more people living in forced labor today than when President Lincoln signed the Emancipation Proclamation. Attorneys for the Thai laborers said many of them initially were taken to farms in Hawaii and Washington state, where the working and living conditions were often deplorable. Other sites included California, Colorado, Florida, Kentucky, Massachusetts, New York, Ohio, South Carolina, Tennessee, Texas and Utah. Several guest workers alleged one of the defendants, Pranee Tubchumpol, promised them pay of $8.72 per hour, plus overtime, with a three-year employment contract. But when they arrived in the United States, they received a fraction of the money and were warned not to leave or talk with anyone outside the farm. "Do not escape or flee because the police or Global [Horizons management] will find, deport, or send you back to Thailand," the workers were told, according to the indictment. The recruitment fees paid by the workers were reportedly as much as $17,000 each, with much of the balance to be paid in the United States, subtracted from the weekly wages. The indictment alleges many of the recruitment fees were financed by debts secured with the workers' family property and homes, which the government says kept many of the employees at the mercy of the defendants. Tubchumpol, who headed international relations for Global, is accused of being the liaison between the company, the guest workers and the Thai authorities. Tubchumpol, 44, was picked up in suburban Gardena on Thursday and had an initial court appearance in federal court later in the day, said FBI spokeswoman Laura Eimiller in Los Angeles, California. She is in federal custody and at some point will be transferred to Honolulu, Hawaii, Eimiller said. The first court appearance for any of the suspects is scheduled for Tuesday in U.S. District Court in Honolulu, said Special Agent Simon. He said the other suspects include Shane Germann, 41, who surrendered to the FBI in Fargo, North Dakota, Friday morning; and Sam Wongsesanit, 39, a resident of Kona, Hawaii, who is expected to surrender to the FBI early next week. Two others are residents of Thailand and are considered fugitives, Simon said. He identified them as Ratawan Chunharutai and Podjanee Sinchai, both females, and said FBI agents in the U.S. Embassy in Bangkok will be working with Thai officials to apprehend them. If convicted, all of the defendants would face sentences ranging from five to 70 years in prison. The company says it provides contract labor in 15 countries, including the United States, on four continents. "Global Horizons Inc. thinks globally and acts locally with a post-9/11-worldview, one which understands that economies cannot continue to grow and prosper without an ample, qualified and legal workforce," says a statement on its website. "Too, it understands the aspirations of countless workers who dream of having better jobs in better places, but who wish to return to their country of native origin when they've completed the job. This fulfills both the economic and security needs of the host country." Global Horizons was cleared two years ago in a federal discrimination case from Washington state, where it was accused of favoring non-Hispanic farm workers in the hiring and firing process on local farms. Simon said the investigation is not over. "There are more than a dozen Hawaii farms that utilized the labor of the alleged victims in this case," he said. "None of these farms have been criminally charged in this indictment. The FBI is attempting to learn the extent that these farms were aware of the forced labor conditions of its workers. With few exceptions, the farms have been cooperating with our investigation." And other investigations are likely, he indicated. "There are more people living in forced labor today than when President Lincoln signed the Emancipation Proclamation," he said. "As long as this is true, the FBI will continue to pursue organizations and individuals involved in human trafficking."